At UC San Diego’s School of Global Policy and Strategy (GPS), our graduates are constantly navigating an evolving political economy, inside and outside the classroom. Solution driven, our degrees have yielded key experts in international relations, public policy and management around the world. In the wake of the recent election season, we highlight how four alumni have utilized their GPS degree to ensure liberty and equality for all. Since the age of five, politics has been in Amy Everitt’s veins. Growing up with a political family in San Mateo, she remembers handing out pamphlets when her grandmother was running for the board of supervisors. From high school campaigns to previous work at the Democratic National Committee, her real passion has always been politics and advocating for her home state of California. Inspiring more than 250,000 members, Everitt explains that the work begins with policy. In her position, she helps endorse hundreds of candidates, ensuring voters know where politicians stand. 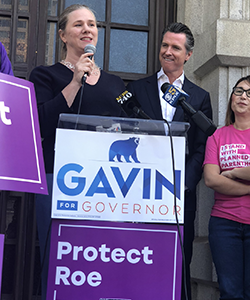 Believing passionately that profit can intersect with social good, she works to ensure reproductive freedom for women and families throughout California. From her GPS toolkit, she remembers Professor Roger Bohn’s Product Design and Product Marketing class fondly, pulling notes from class for her present job. Learning how to become a better product manager, the course helped her formulate the right goals and strategic vision at NARAL. While they might have met in Argentina (and continued their love story at GPS), elections drew them together for the June 5 campaign. Interviewing for different jobs in the Department of Elections, the couple ended up being assigned to the same unit, enjoying the experience of not only working together but conducting elections that are free, fair and functional. A typical day in the Voter Data Analysis Unit includes processing voter registrations, performing validation tasks such as searching for voter data in refreshable spreadsheets in Excel and sending notifications to voters who need to take corrective action on their registration. Passionate about the electoral process, both Canale and Jozami stress the importance of accessibility to all voters when communicating key deadlines and requirements. 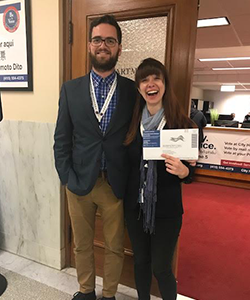 Wanting to get involved in local government, the couple both cite their classroom experience with data and Excel as proving extremely beneficial, as well the meaningful internships that lead them to careers as public servants with the City and County of San Francisco. Federal Voting Assistance Program, Washington, D.C. Growing up and living in Malta, Sarah Vella was not aware that she was eligible to vote. Experiencing first-hand the same frustration that her customers often feel, she was inspired to help citizens vote overseas. 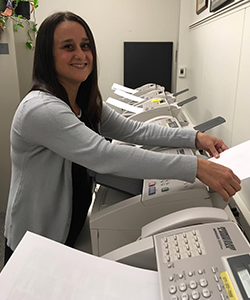 While based in the Washington, D.C. area, FVAP conducts voting assistance officer training workshops at U.S. military installations, embassies and consulates worldwide. Recalling her time at GPS, Vella was grateful for the opportunity to become a Boren scholar, which allowed her to qualify for her current role. While studying abroad in Thailand during the program, she witnessed anti-democracy protests and a military coup, fueling her love of geopolitics. During election season, FVAP’s main goal is achieving excellence in customer service. Voters can call into Vella when seeking voting advice, especially those protected under the Uniformed and Overseas Citizens Absentee Voting Act (UOCAVA). In her position, Vella also conducts research, as well as coordinating surveys and reports, collaborating with the Armed Services, the Election Assistance Commission, the U.S. Department of State and federal contractors.